If you thought hoodies were only for grumpy teenagers and petty thieves avoiding CCTV cameras, think again! The sweatshirt-with-benefits has grown up in recent years and the latest designs are so stylish that wearers will be seeking cameras out. From luxurious materials to cool streetwear options with slogans, we’ve rounded up the most fashionable (and cosy) hoodies that are perfect for grown-ups who want to dress down at the weekend. Known for its understated colour palettes and refined takes on classic garments, Norse Projects has applied that formula faithfully to this sweater. Forest green is a classic tone for the hoodie, but look closely and you’ll see that this one is lightly flecked in white to give it some extra texture. Thick fabric helps the garment hold its shape, which helps smarten up the silhouette, while the soft brushed cotton lining, makes its upper comfortable and warm. The V-stitched collar is a nice nod to vintage athletic wear, and, like those classic designs of old, this sweatshirt is definitely more about quality, comfort and understated style rather than hitting trends. Nike’s ACG line is short for All Conditions Gear and this hoodie is the company’s take on the vintage hiking look. It’s got ivory white fabric, flashes of bold colour and 90s inspired loose fit, ticking multiple fashion boxes for this season. It also claims to be highly usable in the great outdoors, being constructed from insulating fleece for warmth and clad with practical, large pockets. For the fashion forward and downright daring, there are matching ivory fleece bottoms, but just try keeping those clean on a wintery hike. There is no more traditional colour than navy for a hoodie. Oliver Spencer Loungewear has selected a muted hue which will pair easily with blue denim or grey sweatpants. The British fashion brand has neatly tucked the front pockets right round to the sides to give a completely clean appearance from the front, and the collar fastens with a single button adding a hint of formality to the loungewear staple. Undone, this collar could also let a glimpse of a bright t-shirt through, allowing for some creativity in dressing for a Sunday on the sofa. French brand Moncler has solved one of the age old problems of dressing for warmth with this smart hoodie: how to size your top layer when you might choose different base layers on different days. This clever garment features dual zips, so you can fasten it with room for layers on icy days but when the sun shines, maintain a slim fit. Deploying the roomier setting also flashes Moncler’s signature red and white stripes. This clever garment is completed with warm, fleece-back cotton. Stone Island can be forgiven for splashing its name in large letters across the front of this garment, as it is a brand that is riding high and bold logos are definitely having a fashion moment. Drake is a fan of the Italian brand, which now commands a premium for its wares. Every Paul Smith item features the signature rainbow stripes and the brand has become creative at threading the signature detail into its garments. On this unassuming grey hoodie, it’s the drawstring that has been given the rainbow treatment. Other nifty details include the diamond design zip pull embossed with Paul’s signature, and the visible stitching around the hood, giving definition to an otherwise simple design. This is loungewear that makes an event out of a Sunday consuming a box set on the sofa. Ultra-soft cotton jersey material ensures that the requisite comfort levels are met too. The hoodie is available with matching jogging bottoms. If you ever wondered how deluxe the humble hoodie could possibly become, this is the answer. Cut in Italy from fleece backed cotton, and with a price tag of £940, this is the hoodie to relax in when cash flow isn’t a worry. To go some way to justifying that price tag, the cut is oversize, the fabric is generously heavy and even the toggles are extra-long. 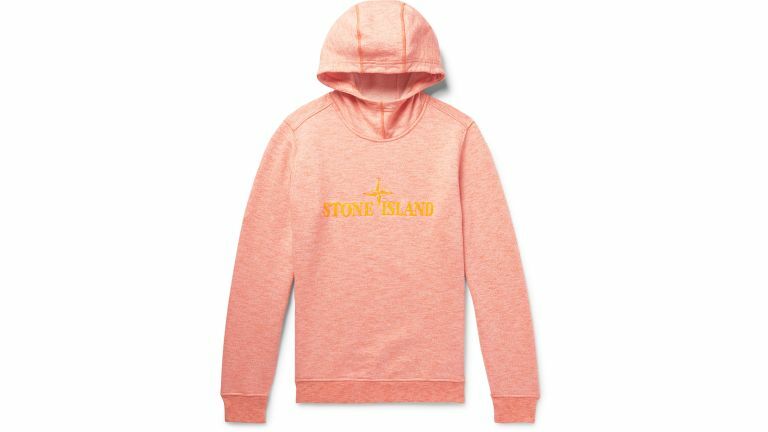 Ironically, the most appealing thing about this hoodie is the one thing which comes for free: the baby pink colour. Redolent of 90s skate fashion, this is the colour to wear a hoodie in at the moment, for those bold enough anyway. A simple contrast of two different fabrics makes this basic hoodie a real stand-out garment. The top half is in a fleece material and the bottom in classic jersey cotton, both in the same navy colour. The arrangement is visually impactful at the same time as being tonally subtle. The whole is a sweater that is so much more interesting than the standard Nike hoodie. Being based on Nike’s tried and tested hoodie design, you know it will also be comfy enough to use for real sports, as well as being hard wearing. This is a simple way to elevate the classic hoodie design, and a smart purchase for its flexibility.